No matter what type of facility or business you manage, you want to provide protection to your employees, visitors, and delicate equipment from inclement weather. Prefabricated shelters provide the perfect solution. From hospitals to gas stations, nearly any business can benefit from the addition of a shelter. Learn more about how to incorporate a shelter on your property to make your visitors more comfortable in today’s blog, below. Prefabricated shelters are beneficial for a wide variety of industries. Whether you have security guards that patrol your perimeter or employees who check visitors in at your facility, a guard booth can help keep them safe, comfortable, and protected. If your facility experiences security threats then you may want to consider the addition of a bullet resistant guard booth for added security. 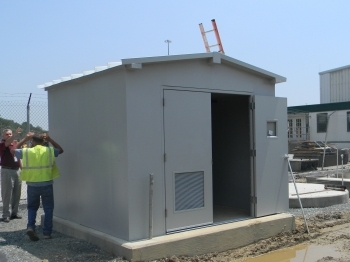 Because your guard shack can be customized with the addition of features such as an HVAC system or restrooms, it can be as luxurious as needed. If your facility is accessible by shuttle or bus service, you’ll want to provide a sheltered area for your employees and visitors to wait for their transportation. A bus shelter will give them an area to wait for the bus that protects them from the elements and provides shelter during inclement weather. From hospitals to university buildings, it is often necessary to provide an outdoor area where people coming to your facility can comfortably wait outside. A waiting area canopy offers visitors a protected area where visitors can check their cellphones or simply get a quick breath of fresh air. Since you can’t let employees and visitors smoke indoors, you’ll need to provide them with a protected and designated area where they are allowed to do so. A prefabricated smoking shelter is the ideal way to protect them while they smoke or take a quick 5 minute break. This entry was posted on Friday, July 8th, 2016	at 12:51 pm	. You can follow any responses to this entry through the RSS 2.0	feed. Both comments and pings are currently closed.